Welcome to the Home of The Science Notebook! The Science Notebook is a collection of experiments, information and demonstrations covering all areas of science and technology, as well as a glimpse into science education of the past. The ideas and experiments here are all about exploring science through experimenting while having a little fun. Some of the experiments you'll see here have been around for a long time and are considered "classics." These are available all over the Internet, and you might wonder why they're here. The answer is simple. The classics are here simply because they are classics. They are the experiments that are easy to do and seem to work every time. In some cases, these classics have been around so long, that the original materials needed to do them are either no longer available, or are very hard to find. Wherever possible, these have been updated so as to be done with newer equipment or material that is readily available. Other experiments and demonstrations are new, either because the science behind them is new, or because there is a newer or simpler way to make something. You'll also find pages from some of the classic A.C. Gilbert science set manuals. These are not intended to be a source of experiments to try. Rather, they provide a view of how science was taught in earlier times. Some of the information you'll find in these old books has since been shown to be incorrect. Therefore they should be read and appreciated for their historical value, and not as a source of current information. Finally, some of what you see here is based on the interests of the webmaster, such as the photo at the top of the page. 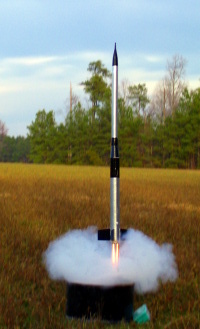 This is a photo of a high-power model rocket built and launched by a friend of the webmaster. This little beauty was almost two meters tall at launch and used 2 "E" engines!